The Labor Ministry on Thursday launched a new three-year policy for improving the lot of Cambodia’s more than 700,000 migrant workers that includes plans to step up monitoring of the country’s often-abusive recruitment agencies and add labor attachés to more embassies. Released to coincide with International Migration Day, the Labor Migration Policy for Cambodia 2015-2018 updates the five-year plan launched in 2010. Nilim Baruah, a senior migration specialist for the International Labor Organization (ILO), which helped draft both policies, said the new plan largely focuses the government’s attention on putting into practice the rules and regulations drawn up as a result of the first strategy. “There is more emphasis in this one on implementation,” he said. Nearly 700,000 Cambodians work in Thailand, attracted by the country’s higher wages. Tens of thousands more work in other countries including South Korea and Malaysia, together sending home millions of dollars a year in remittances, a vital source of income for some of Cambodia’s poorest families. But only about one in 10 Cambodian migrant laborers leave via legal channels, according to the ILO, leaving many exposed to exploitative and abusive work conditions. Many of Cambodia’s own private recruitment agencies charge exorbitant fees, detain trainees before they leave and place them in dangerous conditions abroad with little to no support. At Thursday’s launch, Labor Ministry undersecretary of state Hou Vudthy said the new policy calls on the government to inspect the private agencies on a regular basis, and to ensure recruiters carry their certification with them so workers aren’t duped by imposters. He said the government also aims to place more labor attachés in the countries where most of Cambodia’s migrant workers end up—so far it has only one, in South Korea—if and when it finds the money. 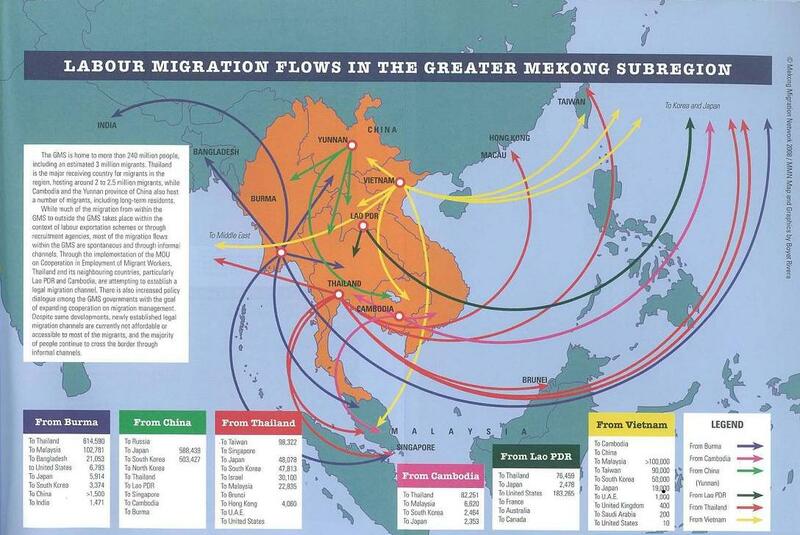 Thailand, which hosts the vast majority of Cambodia’s migrant workers, has none. Jane Hodge, a labor migration specialist for the ILO based in Cambodia, said strengths of the new policy included plans to standardize the memoranda of understanding Cambodia signs with other countries for sending over its workers, as well as the contracts workers sign with agencies. She said most of the necessary legislation to cover migrant workers was now in place, though the fees agencies charge still needed to be addressed. Cambodian Labor Confederation president Ath Thorn, who participated in the workshops the government used to help draft the new policy, said recent government-mandated fee cuts were encouraging more Cambodians to migrate for work legally. “However, most workers still migrate through irregular channels because the process is still hard and complicated,” he said. The new policy includes plans to streamline the process. But as with all plans, Mr. Thorn said the policy will only be as good as the government’s commitment to seeing it through over the next three years. “If we do not implement it properly, we will lose the benefit,” he said.